To meet the demand from our students for affordable an good instruments we have decided to import Student Violins from Europe. On this page you can see and hear some of these instruments. If you are intersted to purchase one of these instruments please contact Cicilia Ongakuin. 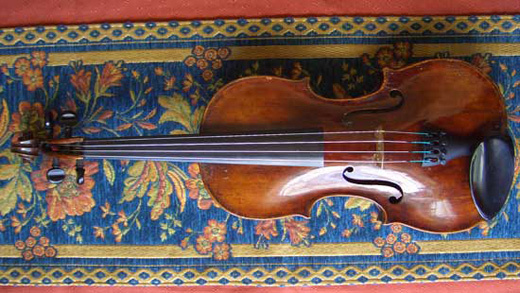 This Violin bears the label of “Julius Caesar Gigli Romanus” This violin is made in 18th century. The maker is unknown. The origin of this instrument could be in Italy. 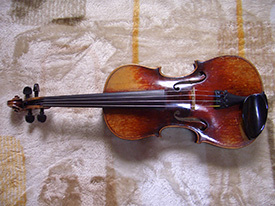 This violin has a charming deep sound in the low range as you can hear on the Video. Quite a dynamic instrument. Made in France about 1900 The varnish is a bit scratched but the sound is very powerful. Also a very nice backside texture in the wood as you can see on the photo.